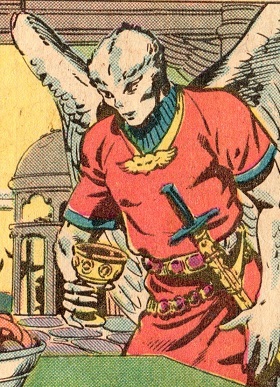 Powers/Abilities: Like other Aerians, M'Dom Typ is a a humanoid possessed of various avian characteristics, like large-feathered wings (M'Dom Typ looked to have a wingspan of 15') with which he could fly, at speeds of perhaps 30-60 miles per hour. He could fly carrying the weight of at least an adult human woman, and he could fly for at least hours carrying such a weight. He was an experienced swordsman, both in gaming and lethal combat. M'Dom was a pleasant and charismatic man, a brave warrior (leading his troops into battle), and a skilled tactician. He delegated authority as appropriate, and he could enjoy relaxed sport as well as an occasional glass of wine (or whatever). M'Dom enjoyed sporting games such as Bala and Kelta. (Ka-Zar the Savage I#2 (fb) - BTS) - From Aerie Shalan, the Aerians -- led by Lord Typ -- experienced a number of severe and unexplained climatic and geological formations, including frequent earthquakes and islands forming and disappearing without warning, and the appearance of strange plant and animal mutations; these were caused by Belasco. (Ka-Zar the Savage#2 (fb) - BTS) - A short time ago, an Aerian spy rediscovered the location of the trip device in Athmeth. A triggering mechanism was constructed to detonate the device. (Ka-Zar the Savage I#2 (fb) - BTS) - The Aerians experienced a week of torrential rain totally unlike their usual fair weather. (Ka-Zar the Savage#2 (fb) - BTS) - Queen Leanne -- who had become disenchanted with being a puppet ruler of Zarhan -- became lovers with Sep of the Aerians, and they made plans to elope. Sep made an arrangement with the Pterons who "kidnapped" Leanne and brought her to Athmeth; faking his death, Sep accompanied her there. (Ka-Zar the Savage I#2 (fb) - BTS) - After Ka-Zar and Shanna fell (and Ka-Zar, at least, was knocked out as his skull struck the rock wall) while scaling the wall between Pangea and the Savage Land, Lord Typ's scouting party caught them in mid-fall, saving their lives, and brought them back to Aerie Shalan. (Ka-Zar the Savage I#2) - After Ka-Zar recovered and marveled at Aerie Shalan, Lord Typ told him of the recent climatic changes. Shanna asked if they had seen a sabre-tooth tiger, and although Lord Typ assured her that no cat could ascend Aerie Shalan's steep walls, Zabu soon fought past a pair of guards and entered the throneroom. As Ka-Zar asked the amazed Typ if he could have his weapons back; Typ approved, but was curious about Ka-Zar's leather sling; Ka-Zar confirmed its nature and effectiveness in the right hands. They were then interrupted by another Aerian, who warned them of an attacking Pteron. They witnessed as the Pteron dropped the insensate Aerian scout, whom a pair of other Aerians caught. Though Typ noted that Aerian troops would soon rise to the attack, Ka-Zar realized the Pteron would be gone by then. 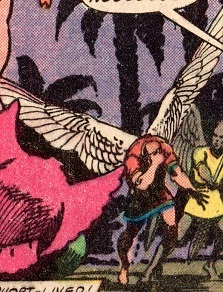 When Typ was irritated by the taunting Pteron, Ka-Zar used his sling to strike the Pteron, dropping him to the ground. The rescued scout noted that their mission had failed, Sep had been killed, and the Pterons had taken Queen Leanne. Noting their long-standing alliance with Zarhan and not wishing to wait until news reached Zarhan, Typ asked Ka-Zar and Shanna to join them in a rescue. Shanna readily agreed, but Ka-Zar -- who had recently had a semi-romantic encounter with Leanne and presumably did not wish for Shanna to learn of this -- initially refused, arguing that the odds were poor and that Leanne may not even be worth risking their lives for. Acknowledging that Lemura had its internal problems, Typ was nonetheless surprised by Ka-Zar's strong reaction. (Ka-Zar the Savage I#2 (fb) - BTS) - A small party of Aerians were sent out as advance scouts for the main party planning to rescue Leanne, but many Pterons were in the sky, and a group of Pterons attacked the smaller party of Aerians. (Ka-Zar the Savage I#2) - Realizing his mistake, Ka-Zar headed back to offer his aid, observed the Pterons attacking the Aerians, and he and Zabu helped defeat and/or drive off the Pterons. (Ka-Zar the Savage I#2) - That evening, over a campfire, Typ agreed to the wisdom of a ground attack, and Ka-Zar offered himself and Shanna to sneak into a back entrance to the Pterons' base; Typ considered this a brave but dangerous plan, figuring the two of them alone would never make it, but Ka-Zar countered that they might if the Aerians provided a diversion. K'lm Fhet then asked to speak, and Typ introduced him as the eldest and wisest among the Aerians, noting that none knew the Pterons better than he. 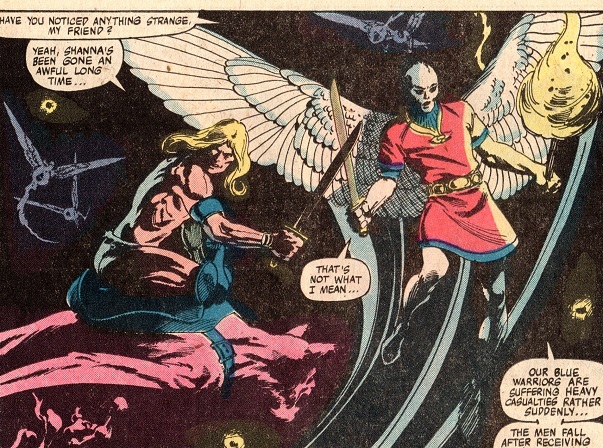 Fhet then noted the trip device within Athmeth's galleries, and Typ advised that Shanna could set the device while Ka-Zar located Leanne; at a pre-determined time, the Aerians would attack and keep the Aerians busy while Ka-Zar escaped with Leanne. Further, with the Aerians blocking Athmeth's entrance, the Pterons trapped in the collapsing caverns would perish. (Ka-Zar the Savage I#2 - BTS) - Ka-Zar and Shanna entered Athmeth through a secret entrance tunnel at its rear. (Ka-Zar the Savage I#2 - BTS) - As Ka-Zar furiously attacked the Pterons, M'Dom Typ's forces alongside Zabu then rushed through Athmeth's main entrance, and a savage battle ensued. After Shanna slew Khalf, the destruct mechanism went off, and Athmeth began to collapse. Prepared for this, the Aerians, Ka-Zar, Shanna, and Zabu all escaped, but most Pterons were trapped or crushed; Leanne fell off a cliff in the ensuing chaos. 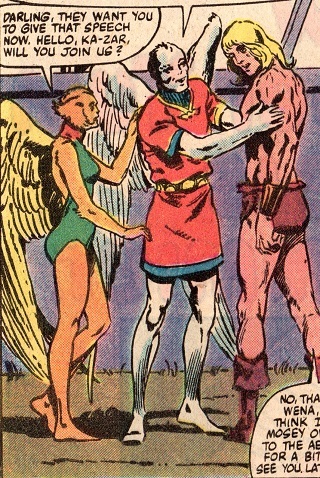 (Ka-Zar the Savage I#2) - Typ thanked Ka-Zar and Shanna for their aid in ending the Pterons' reign of death in Pangea, noting that the Aerians owed them both much. When one of Typ's men noted they had recovered all of the bodies they could get to but had not found Leanne, Typ asked Ka-Zar if he thought Leanne could have survived. Ka-Zar considered it unlikely, then suggested they get some food, after which he would show Typ how to use the sling. (Ka-Zar the Savage I#3) - Alongside his young bride, Wend, M'Dom Typ enjoyed a game of Bala (celebrating the Pterons' defeat) against Ka-Zar and Shanna, both of whom rode Skites and were granted the honor of the first game for having been instrumental in effecting the Pterons' defeat. Typ noted that Ka-Zar seemed to be getting the hang of the game; however, due to some relationship conflicts, both Ka-Zar and Shanna were distracted. After missing a pair of volleys, Shanna angrily served a "ball" (looked a lot more like a shuttlecock), and the force knocked her off balance and off her skite. Disappointed to abandon the game as they had been winning, Typ swooped down and caught Shanna, although she loudly urged him not to bring her back to Ka-Zar. The next day, M'Dom Typ watched from a special position -- alongside Wend and Ka-Zar, at least -- during a match in which the solider Buth defeated another warrior. Typ praised Buth's abilities and, noting Ka-Zar's disinterest, questioned whether he wasn't worried about Shanna. At Buth's request, M'Dom offered a challenge to Ka-Zar; M'Dom rebuked Buth when he taunted Ka-Zar for declining, but continued taunting led Ka-Zar to accept, after which he easily defeated and mocked the unsportsmanlike Buth. Laughing and congratulating Ka-Zar, Typ told Ka-Zar he wished he had a hundred like him. Wend then called Typ away as the other Aerians wanted him to give a speech. At twilight, a Kelta tournament (two teams of Aerians fighting with wooden swords and shields) took place, and Typ explained that it was a point of honor for his team to win. Typ teased Ka-Zar when Buth rescued a falling Shanna, and Ka-Zar, having reconciled with Shanna, kidded back. As they continued the struggle by torchlight, Typ noted to Ka-Zar that it seemed strange how so many of their teammates were suddenly falling and not reviving after receiving only a scratch. Typ's first lieutenant, Khup, then signaled Typ, noting that one of their physicians had detected a drug in the blood of their fallen warriors. Typ noted that he had strictly forbidden such drugs, but Khup then took him to see the captured fallen opponent Chan at the field hospital, who revealed plans to overthrow the kingdom: While the others didn't know the movement's leader, most swords were dipped in a mild drug, but Typ was to be assassinated by one sword dipped in snake venom. While he went to find Wend, Typ sent Khup to retrieve Ka-Zar and Shanna, as well as those of who had been with him the longest, and he would meet up with Khup later. (Ka-Zar the Savage I#3) - Alongside Wend, Typ located Ka-Zar, informing him of the assassination plot. When Ka-Zar was attacked by Buth (who was jealous over a perceived relationship between Ka-Zar and Buth's girlfriend, Delphine), Typ feared the worst when Ka-Zar took a sword strike to the arm; however, Khup fatally wounded Khup with his snake venom-laced sword. Having defeated Buth, Ka-Zar took out Khup with his sling, and the dying Typ had Buth promise to help Ka-Zar restore the kingdom. With his last breaths, Typ told Buth that had mistakenly thought he was the assassin. After convincing Buth to promise to aid Ka-Zar to help restore the kingdom, he bade Ka-Zar and told him to tell Shanna he was sorry for being so rude. Wend is called Wena when first identified and in the second reference in Ka-Zar the Savage I#3, but Wend thereafter. Perhaps Wena is a familiar/nickname version of Wend.